Lahore Bombing Update A blast believed to have been detonated by a suicide bomber ripped through a park in Lahore, Pakistan, near the children's swings, killing at least 65 people who were enjoying a Sunday off. 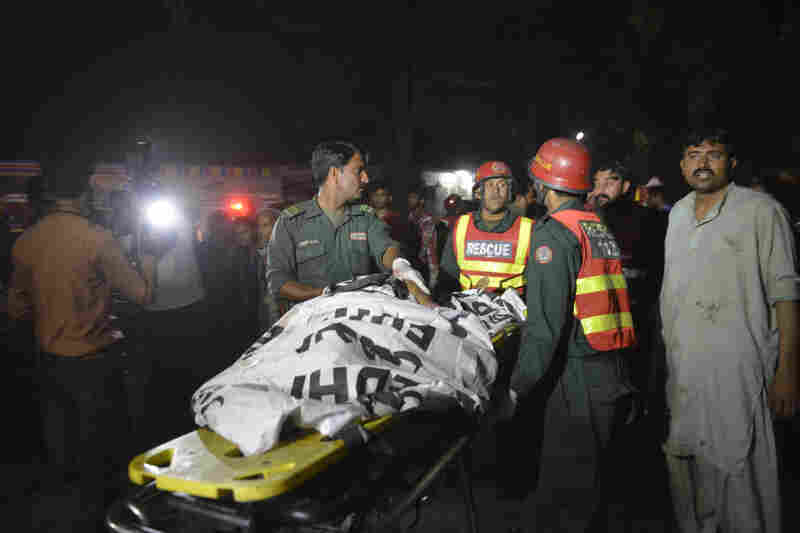 A blast believed to have been detonated by a suicide bomber ripped through a park in Lahore, Pakistan, near the children's swings, killing at least 65 people who were enjoying a Sunday off. This is ALL THINGS CONSIDERED from NPR News. I'm Daniel Zwerdling. Michel Martin is off today. There's been another terrorist bombing, this time in Lahore, Pakistan, and this time in a park near the children's swings. Officials say more than 65 people were killed, and it was a suicide bombing. NPR's Philip Reeves joins me on the line now from Islamabad, Pakistan. Phil, from your sources, can you describe the scene? PHILIP REEVES, BYLINE: Well, this happened in a pretty big park, a place called Gulshan-e-Iqbal Park. It happened on a warm Sunday evening. Sunday's part of the weekend in Pakistan, unlike many other places in the Islamic world, and people were out enjoying the weather, enjoying the day off. Reports suggest that there were a lot of women and children. This happened near the area where children play, near the swings. The death toll is high, and officials say it will likely rise further. And the number of injuries gives you the size of a crowd. It's said to be very high. Officials are talking about around 300. ZWERDLING: There's no words to say how depressing this all is. We're hearing early reports, unconfirmed, that the Taliban is claiming responsibility. What do you hear? REEVES: Well, according to the Reuters news agency, a faction of the Taliban has claimed responsibility. Attacks like this often are met by claims of responsibility by a number of different organizations, so this is one of them, according to Reuters. But what perhaps is significant about it is according to that news agency, a spokesman for that faction is claiming that the target of the attack was Christians. Christians are a very, very small minority in Pakistan. But it is Easter Sunday today, and a lot of them will have been out enjoying themselves in Lahore. ZWERDLING: The Taliban carried out that horrific attack on a school in Peshawar, Pakistan just a little over a year ago. More than 140 people were killed. But the Taliban has seemed kind of quiet since then in Pakistan. REEVES: Well, it's been heavily squeezed. That attack on the army-run school in Peshawar that you mention, Danny, was a complete game changer in Pakistan, really. I mean, it was a terrible attack. Around 130 schoolboys were killed. And it changed the public mood. 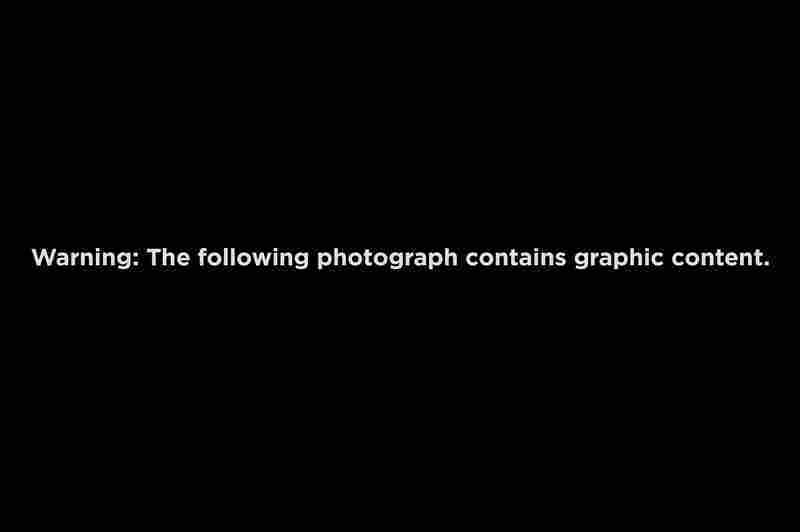 The public was generally appalled. And so the army was able to press ahead with a big offensive against the militants, particularly in the mountains bordering Afghanistan - which was already underway when the attack happened, but they were able to push ahead with it. And also in the city of Karachi, which is another militant stronghold in Pakistan. The army crackdown meant that the number of attacks went down, the public mood improved and the militants felt squeezed. And so the speculation right now is that this is an attempt by the militant Islamist groups to respond to that pressure. ZWERDLING: NPR's Philip Reeves in Islamabad. The right words don't seem to be thank you, but thanks. Officials and rescuers gather at the blast site, next to an amusement ride. Rescuers use a stretcher to shift a body from Gulshan-e-Iqbal park on Sunday. Rescuers carry a body in an ambulance from the bomb blast site. An eyewitness talks with media representatives after the explosion at the park, where families were gathered to enjoy springtime weather. 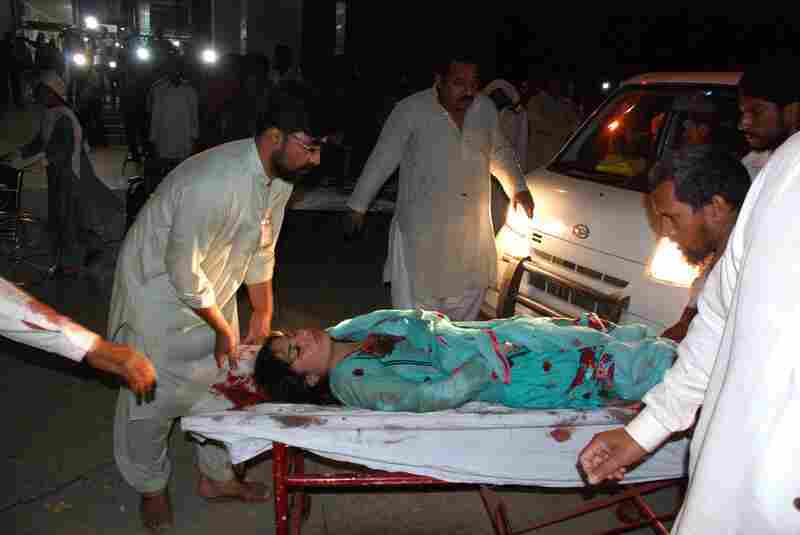 Relatives bring an injured woman to a hospital in Lahore. At least 70 people have died in an explosion in the city of Lahore, Pakistan, according to local police. Hundreds more were injured. According to Reuters, the attack was claimed by the Taliban faction Jamaat-ul-Ahrar. "The target were Christians," said a spokesman for the faction, Ehsanullah Ehsan. "We want to send this message to Prime Minister Nawaz Sharif that we have entered Lahore. He can do what he wants, but he won't be able to stop us. Our suicide bombers will continue these attacks." The blast struck Gulshan-e-Iqbal park on the western side of Lahore, which features wide lawns, a boating lake and amusement rides. 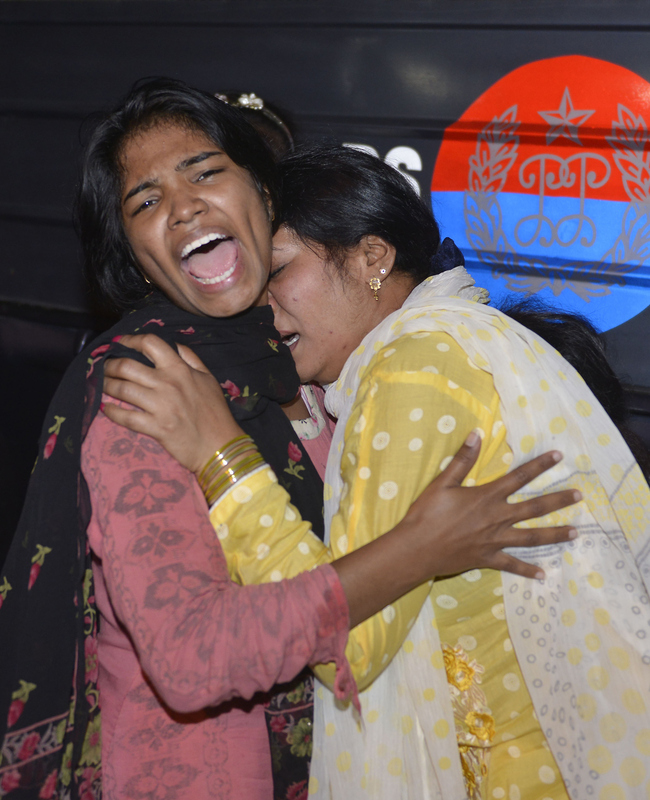 Women mourn the death of relatives after a bomb blast in Lahore, Pakistan, on Sunday. The large public park was crowded with people enjoying a spring evening, NPR's Philip Reeves reports from Islamabad. 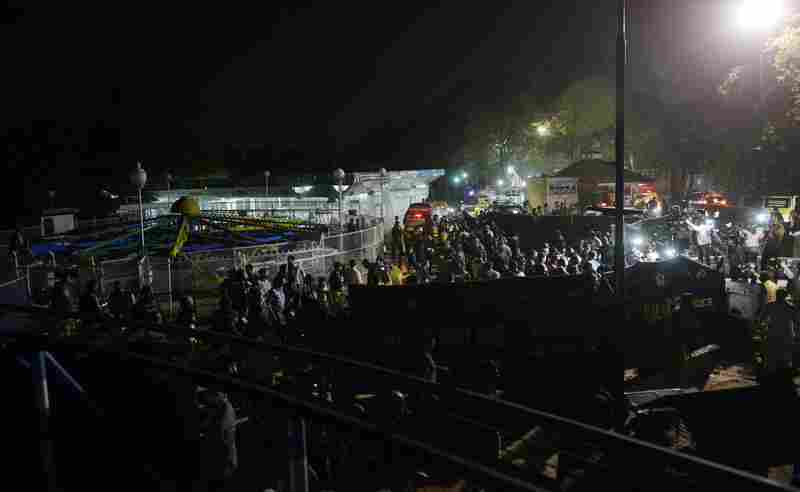 Local police chief Haider Ashraf told The Associated Press that many families were leaving the park at the time of the explosion, which he said hit near the children's rides. 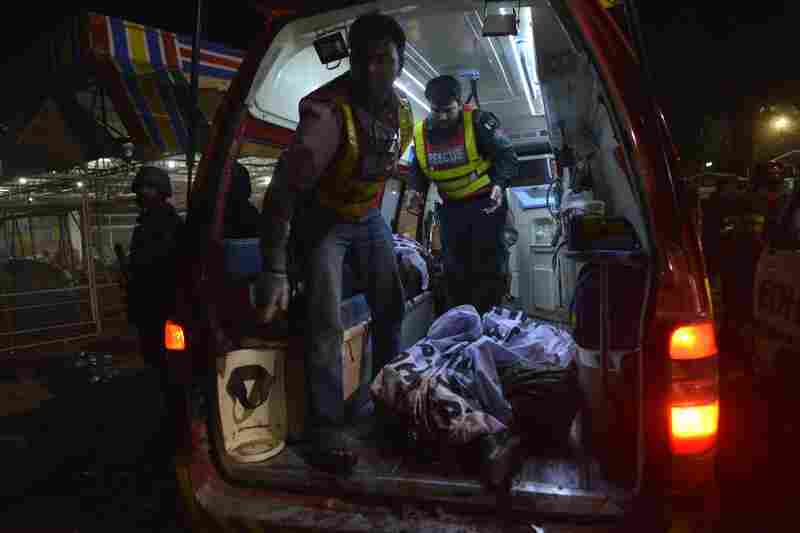 The casualties included many women and children, Reuters reports, citing a superintendent of police for the area. The prime minister of India, Narendra Modi, condemned the attack on Twitter. "This cowardly act in what has long been a scenic and placid park has killed dozens of innocent civilians and left scores injured. We send our deepest condolences to the loved ones of those killed, just as our thoughts and prayers are with the many injured in the explosion." In the wake of the attack, the hashtag #LahoreBlast was trending on Twitter. Some tweets said hospitals in Lahore were running low on blood, and exhorted residents of Lahore to donate if they could. 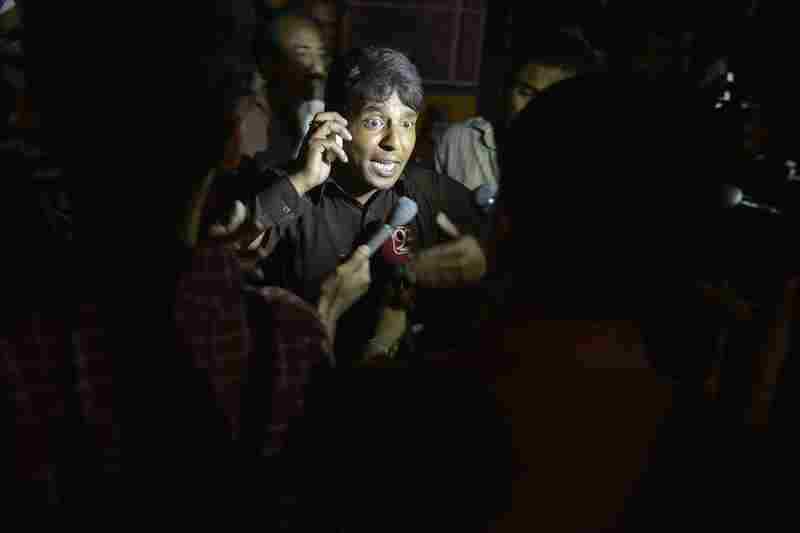 Many expressed sorrow and anger at the blasts. "It's a park for gods sake!! Children on swings!! How can anybody even have the heart to do this," tweeted Pakistani actress Mahira Khan. Facebook turned on its Safety Check feature to allow users in the area to signal to friends and family that they are safe. But they appeared to have some issues with location accuracy: Many users posted online that they'd received the prompt telling them to check in — although they were not, and never had been, in Lahore or even in Pakistan. Later, Facebook released a statement addressing the malfunctioning feature: "This kind of bug is counter to our intent. We worked quickly to resolve the issue and we apologize to anyone who mistakenly received the notification." "Islamists have attacked it regularly over the years, but for many months Pakistan's army and security services have been carrying out a big military operation against militant groups — especially aimed at the Taliban in the mountains bordering Afghanistan. "As violence dipped, the people of Pakistan began to relax. Business picked up — and, in Lahore, tourists started to return." Today's attack, he says, is "another reminder that the conflict in Pakistan is far from over."